Mon.-Sat. 11 a.m.-10 p.m.; Sun. 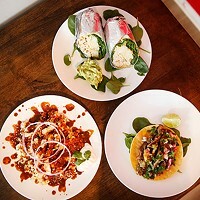 11 a.m.-9:30 p.m.
Squirrel Hill has a lot of, if not exactly hole-in-the-wall venues, then small storefronts well-suited to modest establishments specializing in the take-out, snacks and treats trade. 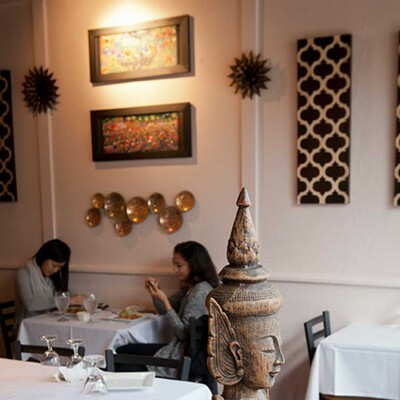 Turnover in these spaces is usually marked by superficial changes in decor, but recently, a new Thai restaurant upped the ante, transforming a drab, cramped storefront we used to walk right on by into an enticingly cozy sit-down "bistro." Inside Sukhothai — named after the ancient capital of a Magna Carta-era empire, and unrelated to two previous local restaurants by that name — a graphic black-and-white color scheme simplifies and unifies both wall and table décor. Balanced, even restrained, compositions of bric-a-brac made for an effect more curated than cluttered. Polished metals and mirrors glimmered softly in the low light of an autumn evening, lending credence to the restaurant's subtitle, "The Art of Thai Cuisine." 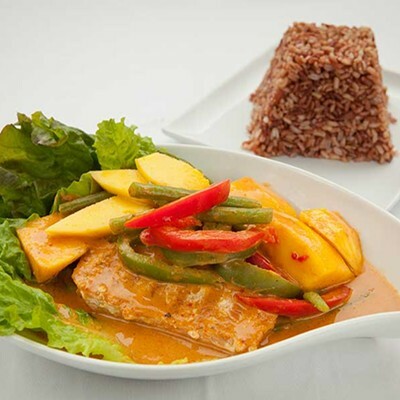 The menu featured a largely typical assortment of curries and rice and noodle dishes, peppered with a few more intriguing preparations among the chef's specials and entrée lists. 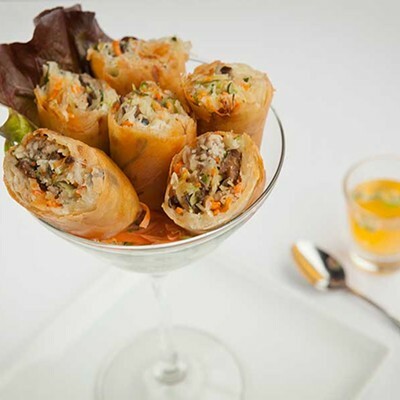 Two eponymous dishes — an appetizer roll and the "Wild Sukhothai" entrée — especially caught our attention. 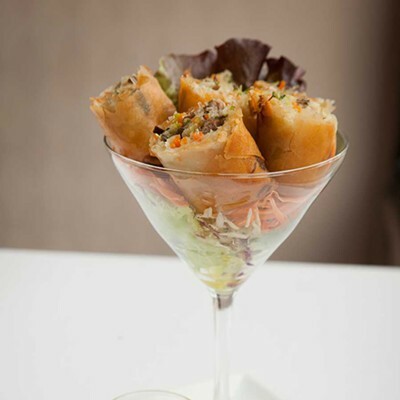 The Sukhothai roll, a crispy spring roll, was artfully served in a martini glass, halved with cut sides up so that the exceptionally colorful fillings were on display. The ingredients — shrimp and pork, cabbage and carrots — were standard, yet the roll, freshly made in house, was well above average, even truly excellent. 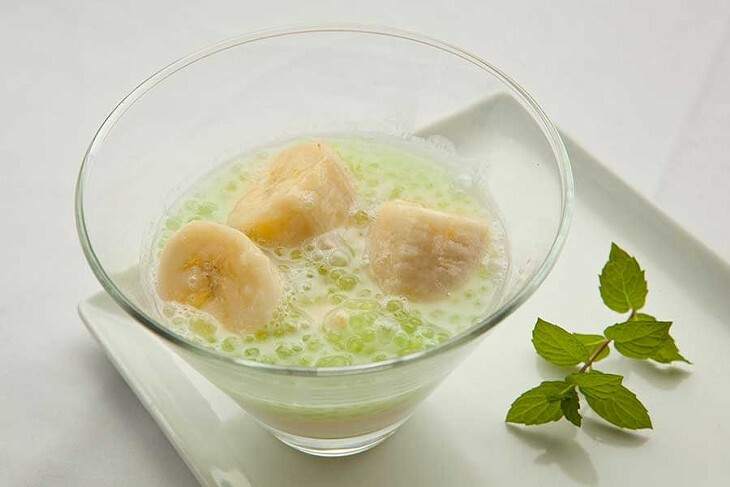 The accompanying sweet-and-sour plum sauce was thin and light, not heavy and gloppy, adding verve without obscuring the very good fillings. Satay and crispy tofu, cubed and skewered, were similarly simple but perfectly cooked: the former charred yet juicy, the latter fluffy and light within the crisped fried coating. The satay's peanut sauce was fine, but the sweet-and-sour peanut sauce that came with the tofu was light and bright, studded with diced peanut to provide earthiness and crunch. Deep-fried, marinated "chicken wings cha cha" weren't as spicy as their name suggested, but their distinctive spice profile was a lot more interesting than the so-called Thai chili wings that have started popping up at bars. Translucent, crisp fried basil leaves added beauty, flavor and textural interest. 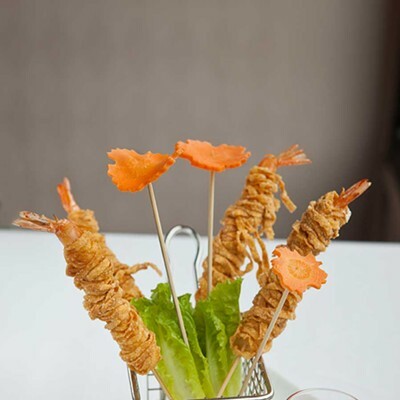 The kitchen's art certainly came to the fore with pineapple fried rice, where the signature ingredient arrived as a quarter fruit, core intact, its edible chunks cut and arrayed to be plucked out one at a time from this sort of pineapple basket. The rest of the dish was straightforward, with corn and tomatoes striking us as slightly odd, New World inclusions. The best thing about it was the texture of the rice itself, chewy with crusty edges, but never hard or dry, and not a hint of grease. Of Sukhothai's six noodle offerings, many are closer to soups than to plates of Asian-flavored pasta. 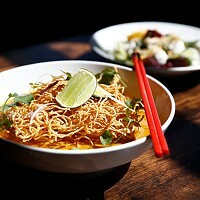 We picked kaw soi, promising crispy and soft noodles "floated" in a curry sauce. The texture and flavor array was actually even more complex, almost akin to Vietnamese pho: the fried noodles, pungent diced red onion and short-cut green beans were each crisp and crunchy in their own fashion, contrasting with a substantial ballast of tender sliced chicken breast and soft rice noodles, all bathed in a spicy, creamy sauce brightened with lime. 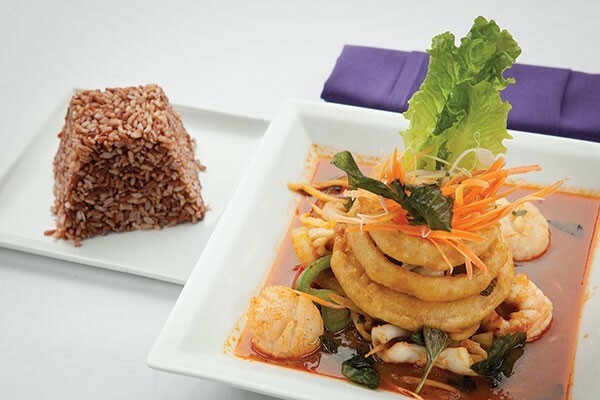 Like the far more overexposed pad Thai, this dish encapsulated the symphonic harmony of disparate flavors and textures for which Thai cooking is famous. Despite declaring it "too spicy," our first-grader kept coming back for more. Roti scallop, a chef's special, was also satisfying, with plump scallops nestled in a dish of green curry with eggplant, red pepper and wedges of flaky roti flatbread. Cucumber salad wasn't the typical style, floating in a bowl of sweet-tart dressing with peanuts and onion, but rather a carefully arranged bowl of cucumber straws, lightly dressed and popping with garlic flavor. By contrast, the irresistibly-named Wild Sukhothai was a complete flop. The promised crispy chicken was soggy in a "spicy sauce" that wasn't very spicy, but was all too reminiscent of a Chinese-style sweet-and-sour. But this was a glaring exception to a meal that was otherwise notably, even artfully, consistent in quality. 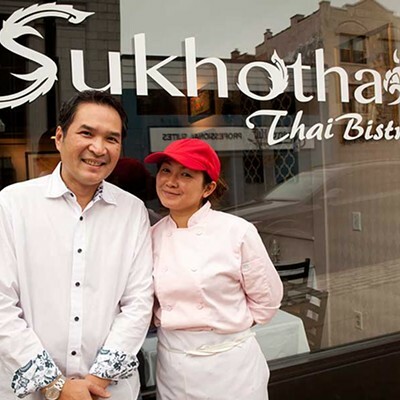 Sukhothai broadens the Thai dining scene in Pittsburgh by merging the traditional flavors and preparations of Thailand with modern European bistro aspirations.